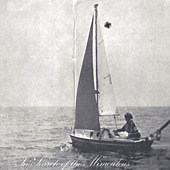 Dutch/Californian artist Bas Jan Ader was last seen in 1975 when he took off in what would have been the smallest sailboat ever to cross the Atlantic. He left behind a small oeuvre, often using gravity as a medium, which more than 30 years after his disappearance at sea is more influential than ever before. Bas Jan Ader was born to idealistic ministers in the Dutch Reformed Church on April 19, 1942. His father was executed by the Nazis for harboring Jewish refugees when Ader was only two years old. A rebellious student, he failed art school at the Rietveld Academy, where friend Ger van Elk recalls that he would use a single piece of paper for the entire semester, erasing his drawings as soon as they were finished. At the age of 19 he hitchhiked to Morocco, where he signed on as a deckhand on a yacht heading for America. 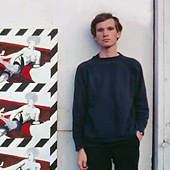 The yacht shipwrecked off the coast of California, and Ader stayed in Los Angeles where he enrolled at Otis Art Institute. There he met Mary Sue Andersen, the daughter of the director of the school. They married in Las Vegas, where he used a set of crutches to symbolically prop himself up during the ceremony. Ader then taught art and studied philosophy at Claremont Graduate School. In 1970 he entered the most productive period of his career, beginning with his first fall film, which showed him seated on a chair, tumbling from the roof of his two-story house in the Inland Empire. In 1975 Ader embarked on what he called “a very long sailing trip.” The voyage was to be the middle part of a triptych called “In Search of the Miraculous,” a daring attempt to cross the Atlantic in a 12½ foot sailboat. He claimed it would take him 60 days to make the trip, or 90 if he chose not to use the sail. Six months after his departure, his boat was found, half-submerged off the coast of Ireland, but Bas Jan had vanished.